National Blog Posting Month – its a really cool idea, an alternative to national novel writing month. So I had better get my thinking hat on, as I am going to post everyday in Novemeber. For more info go here. You are a natural born leader, even if those leadership talents haven’t been developed yet. I saw this over on Caught Knitting and it seemed kind of relevant. I received yet another parcel the other day, a birthday parcel from my SP9. Being the dap that I am a deleted my inbox the other day and don’t have her e-mail, so SP9 if you’re there please e-mail me and thank-you for my birthday present! I received two balls of sock yarn in lovely deep autumnal colours. The photo doesn’t do them justice they are deep burgendy/brown with pinky highlights in one and multicoloured highlights in the other. 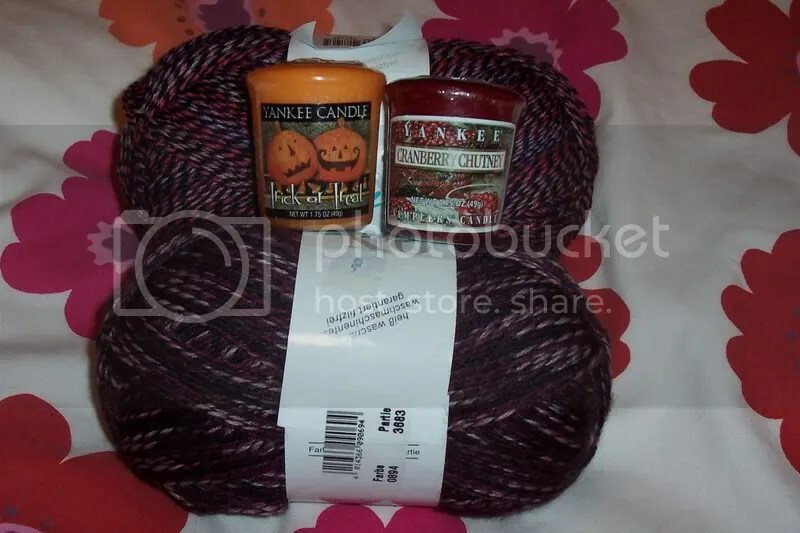 I also got two Yankee Candles, one cranberry and one pumpkin and some Lindt Lindor Halloween ltd edition – not in photo as I ate them. They were very yummy! So, I posted about all the parcels i’ve received not really about the knitting i’ve been doing so I guess now is time for a WIP/FO update. I completed my first toe-ups last night. I am really pleased with them. 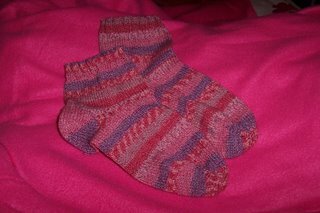 I also completed Denmark from Nancy Bush’s Knitting on the Road. 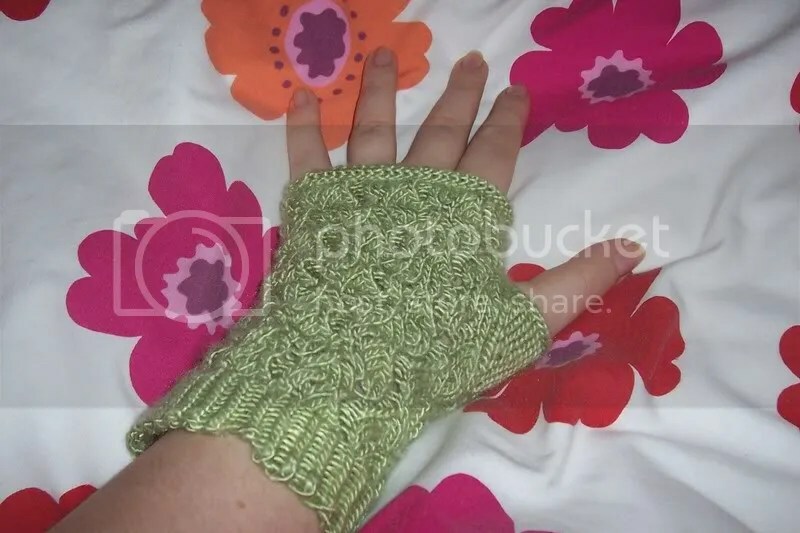 I love this pattern and will definetly be making more. The pattern is pretty easy but looks fab! 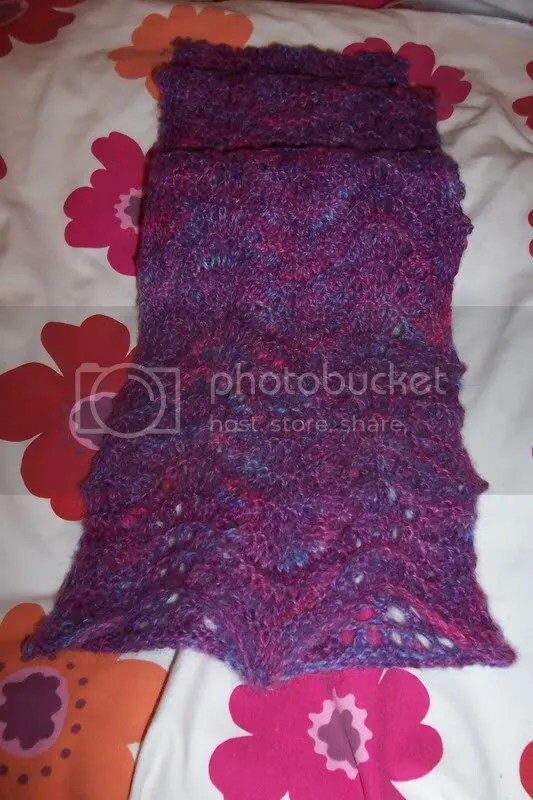 I finished my scarf to send to my ISE 3 pal. 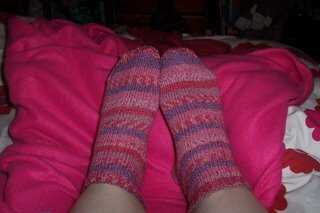 This took longer than I expected to knit but once I was over half way it seemed to go quicker. The worst thing about this was blocking, as I had never blocked lace before. My Mum kept asked for a matching scarf, hat and gloves set for xmas. I have completed the scarf and have cast on for the hat. I am using Twilleys Freedom Spirit and pattern book that goes with it. 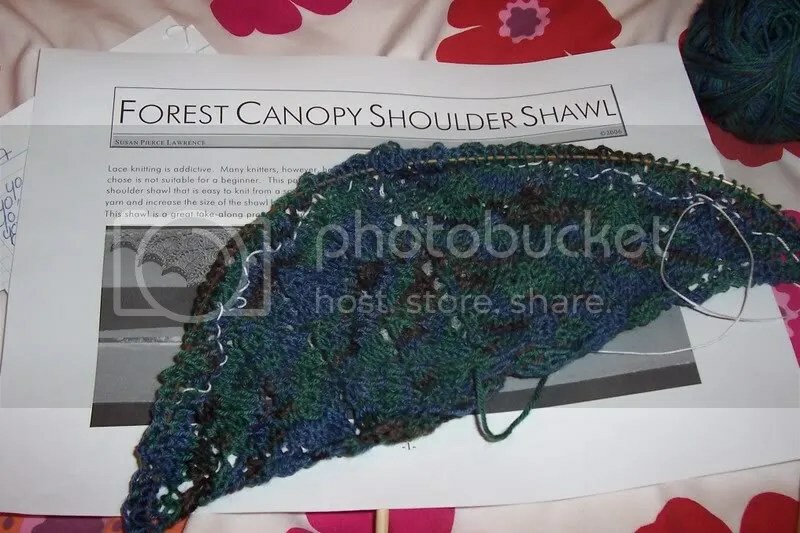 As can be seen I’ve been pretty busy, I have three projects on the needles at the moment. I’m hoping this post looks ok as blogger was playing up and I had upload my photos to photobucket and them link to them. I’m not sure how much knitting is going to be happening over the next few days as it will be my birthday. I am off to my friends tomorrow who is holding a birthday/halloween party for me so expect some bizare photos of us all dressed up in our fancy dress. I received a gorgeous red and navy alpaca scarf along with some yummy chocolates. I am eagerly awaiting the colder weather now so I can wear this oh-so-soft scarf. Thank-you!!! Where to being…I was spoiled by Miss Priss Knits and spoiled I was with both tea and knitting content. Thank you. the parcel was perfect! 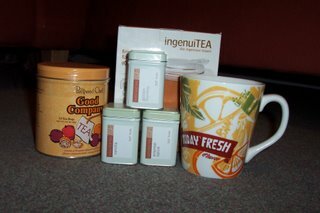 Adagio Ingenuitea, Mug, Adagio teas (golden monkey, oriental spice & vanilla), tropical tea bags. I have very quickly become dependent on the Adagio Ingeuitea and wonder how I managed without one. I have tried the teas and they are really nice, esp the Oriental Spice. I will defintely being ordering from their website. knitting magazine, stitich makers, sugar n cream yarn ( 4 balls, 2 pink variagated and two green), bamboo needles, (pics of later to follow). 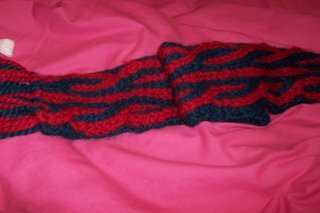 To make it even more perfect one of the sugar n cream ballband patterns was for a tea cozy, so I think I have to make one. and legendary Jelly Bellys, I love these but they are just soooo expensive in the UK. As you can tell my postie has been very busy. 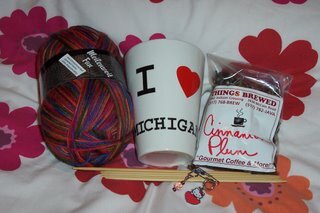 I received another gorgeous parcel in the Hot Socks swap which was Laura’s first time as hostess. Well done Laura and thanks for a great swap. This parcel reminds me of autumn, the lovely deep jewel tones of the yarn and the sublime warming smell of the tea. I have yet to try it as there is only so mcuh tea one girl can drink and recently i’ve been inundated. But if it tastes as good as it smells i’ll be in heaven. I just love cinnamon. If you could suddenly never knit again, what would you do instead? You mean apart from going insane, probably learn to spin or leanr to play an instrument. If you could travel anywhere in the world, where would you go and why? This is a tricky one as it is a tie between Russia and Kenya. I’d love to go out to Kenya and work with the wild animals on the nature reserves, but i’d also love to visit Russia as I studied Russian History for my history A level and would love to visit the places I learnt about. When you were little, what did you want to do when you grew up? Are you doing it? I knew I wanted to go to university and (eventually) I got there. I didn’t have one specific thing, which is probably why I have drifted around in my employment. At the moment I refuse to make plans and will just see where I drift. My life as I knew it has completely gone. I split from my boyf last friday and am still coming to terms with it. We remain friends which is a good thing as we are still living together at the moment. I am on a mission to find a new home but three weeks into the academic year is not the best time to find decent student accomodation. Since this bombshell, knitting has been miminal. 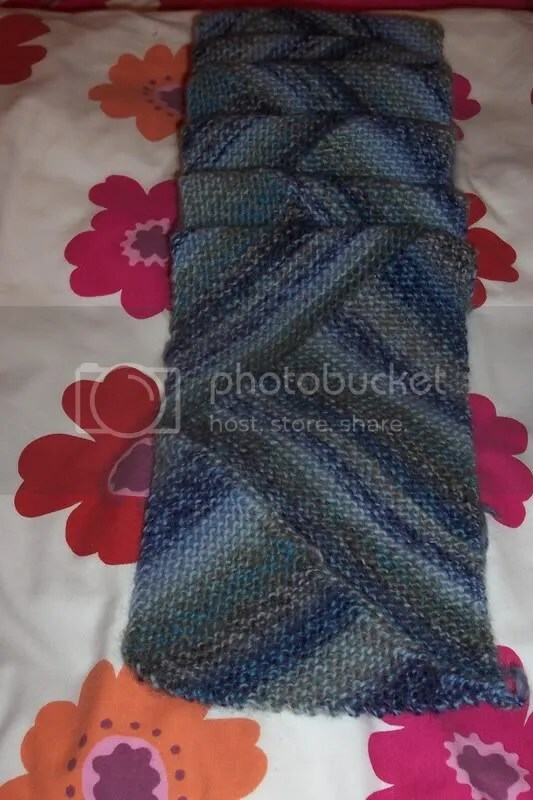 I have nearly completed my ISE3 scarf, it should be done in the next few days, and I have frogged my first toe-ups once and after finding another mistake last night they will frogged again. I think I will change to widdershins as I am finding Baudealaire a bit tricky and with all that has happened my brain really needs a simplet knit. 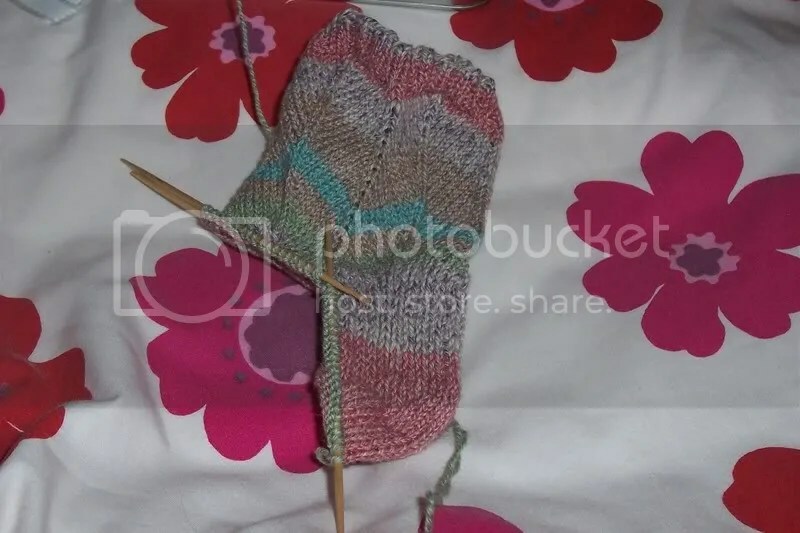 I turned the heel on my first jaywalker last night so that should be finished by the end of the weekend. I recieved my SP9 spoliee and have made contact. I am really looking forward to spoiling them and have plenty of treats in mind. I am really pleased with who I have been given as I am aware of her blog and she seems really nice. My SP9 spolier has made contact so things are going well. I am just awaiting one more thing for my KTS2 pal to arrive then it’s off to the post office with that. I recieved my ISE3 scarf the other day and it is so lovely. The softest I’ve ever felt. Pics to follow. I had better get back to work as I have an assignment to finish for uni.